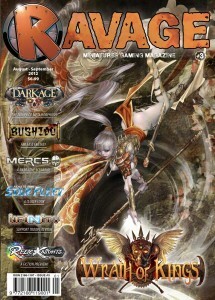 Ravage Magazine has Issue #3 available now for the US audience. And remember, this isn't just a simple translation of the French magazine. There's lots of unique content (I know, because I wrote some of it) for the US release. Our third installment of the newly re-imagined Ravage Magazine US is just a hint of what we have in store for the future. Miniature game enthusiasts and hobbyists alike will notice that this issue is different than those before it, with our content moving towards being unique and never-before-seen in print! We have gone to great lengths to pack it full with useful game information and hobby skills from a host of different professionals throughout the industry.